From left to right: Arvind Kapur, Executive VP, SOTL; Gautam N Mehra, CMD, SOTL; Sunil Aima, CEO, SOTL; S. N. Barman, VP, Tata Motors; Subhajit Roy, Senior General Manager, Tata Motors. 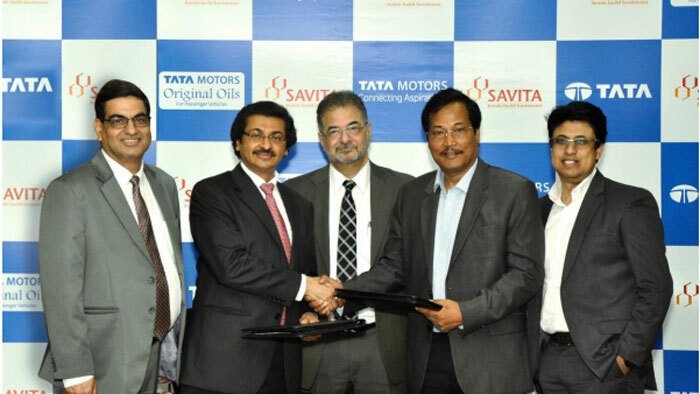 Savita Oil Technologies Ltd., a leading manufacturer of automotive, industrial and consumer lubricants based in Mumbai, India, has signed an agreement with Tata Motors to manufacture and supply original or so-called ‘genuine’ oils for the passenger vehicles segment under the brand ‘Tata Motors Original Oils’. The product will be supplied from Savita’s lube oil blending plant in Silvassa, which is a fully automated state-of-the-art manufacturing plant, certified for ISO 9001:2015 and ISO 14001:2015. “We want to ensure world-class service, spares, and consumables for all the after-sales needs of our customers. With this aim in mind, we are proud to announce the launch of ‘Tata Motors Original Oils’. With this introduction, we will ensure easy availability of recommended engine oils for our car buyers, for the long-term health and maintenance of their vehicles. Furthermore, with the association with Savita Oil Technologies Ltd, we guarantee that our customers will receive the finest quality of product which will, in turn, help them extract the best performance out of their engines,” said S. N. Barman – vice president, Sales, Marketing & Customer Support, Passenger Vehicles Business Unit, Tata Motors. “We are excited about this partnership with Tata Motors – one of India’s largest OEMs, for manufacturing and supplying original oils for their Passenger Vehicles business. This is a reaffirmation of the very high-quality standards that we adhere to across all our product lines. This partnership bears testimony to our commitment to quality, technological advancement and heightened customer engagement, thus co-creating right value for all stakeholders. The rich experience of managing OEM partnerships gives us the confidence to deliver benefits envisaged in the launch of Tata Original Oils,” said Gautam N. Mehra, managing director of Savita Oil Technologies Limited. This partnership will also help Tata Motors deliver original products at the right price and will ensure easy availability through the bazaar channel. This new range of genuine oils, which will be supplied by Tata Motors’ authorised parts distributors in the aftermarket, complements the existing original parts business of the company’s channel partners. Savita Oil Technologies Ltd is a 57-year old specialty petroleum product company listed in the Bombay Stock Exchange (BSE) and the National Stock Exchange (NSE). Savita Oil Technologies Ltd is one of the largest private manufacturers of petroleum specialty oils and lubricants in India, with a sales volume in excess of 300,000 kilolitres (KL) and an annual turnover of more than INR2,000 crores (USD 278 million). Savita is also a market leader in transformer oils and white oils. The company operates three manufacturing facilities in Western India. Tata Motors Limited is a leading global manufacturer of cars, utility vehicles, buses, trucks and defense vehicles. Part of the USD100 billion Tata Group, Tata Motors is India’s largest and the only OEM offering an extensive range of integrated, smart and e-mobility solutions. Tata Motors has operations in the UK, South Korea, Thailand, South Africa, and Indonesia through a strong global network of 109 subsidiary and associate companies, including Jaguar Land Rover in the UK and Tata Daewoo in South Korea.